WACO, TX — ARC Abatement Holding, Inc. is the 2017 recipient of the Well-Managed Business of the Year Award from the Institute for Family Business at Baylor University. ARC Abatement Holding, Inc. is the parent company to four integrated businesses: ARC Abatement, an asbestos and lead abatement company; ARC Roofing, a commercial roofing company; C&C Coating and Construction, an oilfield services company and Lone Wolf Resources, an environmental remediation company. This year marks the 28th anniversary of the awards program. Baylor University’s Institute for Family Business has hosted the Texas Family Business of the Year awards program every year since 1989. The Awards ceremony was held in the Paul L. Foster Campus for Business and Innovation in the Meyer Conference Center on the Campus of Baylor University in Waco, Texas. The Institute for Family Business at Baylor University promotes the tenets of Firm-Family-Faith on a global scale through rigorous scholarly research, transformational student learning and engaged Christian fellowship between family-owned businesses and Baylor University. 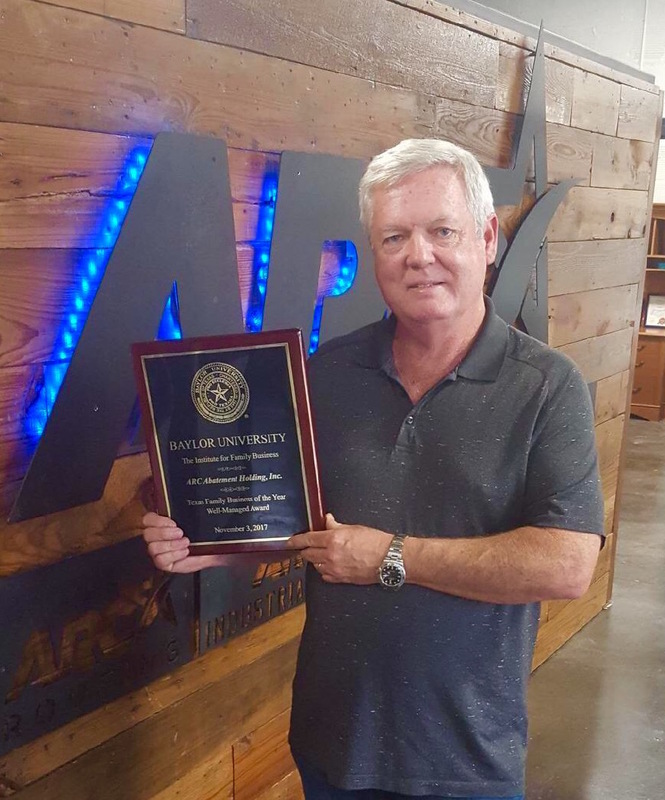 The Texas Family Business of the Year Awards Program recognizes multi-generational, family-owned firms whose families demonstrate a commitment to each other, to their employees, to the community, and to business continuity. Visit the website to learn more.